We continue with our (seemingly unending) walkthrough of Dobzhansky’s evolutionary classic, Genetics and the Origin of Species. Today we will finish his chapter on Selection; the rest of the book will be a cakewalk in comparison. Natural selection was not unique to Darwin, having been recorded by numerous others, including the watchmaker-hypothesis’ William Paley. But for these pre-Darwinian writers (with two minor exceptions, noted in the opening of the sixth edition of the Origin of Species), natural selection was simply a way of preserving the created species. Forces would try to alter the species into less-adapted products; natural selection would winnow out those mutant forms, allowing the species to remain relatively pure. Selection, then, was like a hangsman, killing off what nature abhorred. Darwin’s major insight was to raise the status of natural selection from preserver and destroyer to the primary creative force in nature. (I am indebted to Stephen Jay Gould’s book The Structure of Evolutionary Theory for much of this discussion). 1. A primary complexifying force, that changed creatures upwardly from simple organisms to complex organisms. Lamarck envisioned life as climbing up a ladder of complexity. The simplest organisms were constantly being produced by spontaneous generation and then embarking up this ladder; every species currently in existence was more-or-less complex depending on the age at which it was first produced. Thus the human single-celled ancestor appeared on the scene a long time before E. coli’s single-celled ancestor, and had had more time to complexify. Differences in the complexity of modern organisms were due to different starting times for the different ladder. 2. Secondary force of adaptation, which diverted organisms away from the ladder as they advanced up it, allowing no two ‘ladders’ to be identical. Adaptation was either a change induced by the environment or by the need of the organism, with those induced changes being passed on to their offspring. 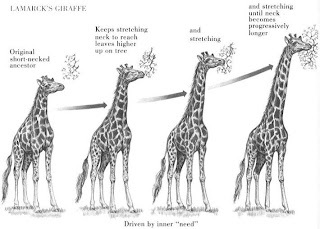 Thus the giraffe has a long neck by virtue of its ancestors stretching their necks in pursuit of ever-higher leaves. Darwin’s theory of evolution by natural selection removed the first force entirely, giving the force that causes adaptation primacy. But this force was not adaptive change caused by need; it was natural selection operating on random, non-directional variation. 3. Natural selection works gradually through deep geologic time to produce all of life’s diversity. 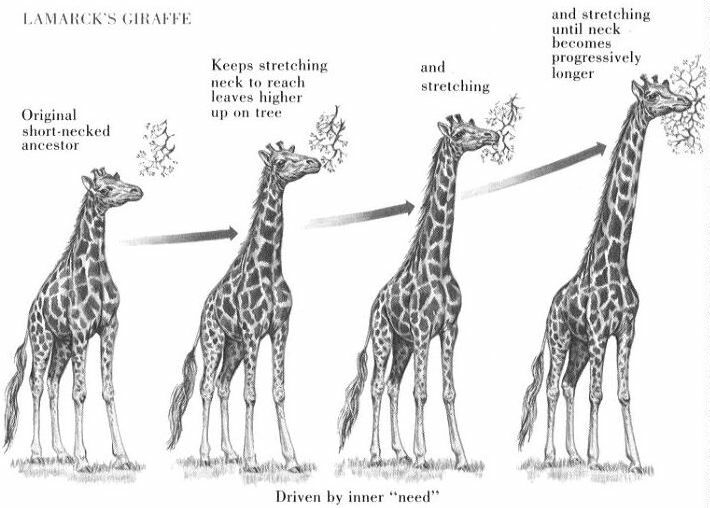 As you can hopefully see, whereas Lamarck saw adaptation as an internal drive, Darwin saw it as the result of external selection. Selection, and selection alone, worked on raw variation to produce life’s diversity. It was not just a hangsman working subordinately to some complexifying force. It was the be-all and end-all of evolution. According to Gould, these three aspects of selection have been modified in the 150 years since Darwin published the Origin. Indeed, Dobzhansky himself harboured doubts about number three, saying that, without any means of testing gradualism, we must reluctantly put an equal sign between microevolution and macroevolution. There was definitely considerably debate about number 2. How could natural selection be creative? Gould helpfully tells us that selection could only be creative if variation itself was not creative. That is, variation needed to be abundant, of small effect, and not heading in any direction. From this raw variation, selection could be ‘creative’ by promoting those variants that are better-adapted to their environment (it is not creative in the sense of creation out of nothing). Selection, therefore, is like a potter shaping clay; it does not produce the clay, but is able to mould the clay into beautiful forms. The clay is variation – abundant but amorphous, with no internal drive to shape itself. In Darwin’s day, Fleeming Jenkin objected strongly to giving selection a creative role. He envisioned species as glass balls. In the center of the ball resided the core of the species. Extending from the center to the surface were the directions that selection could take to alter the species from its core. But once selection reached the surface of the ball, it was maxed out; there was only so much that selection could do with limited variation. We can now see the importance of Dobzhansky’s work. He spent so much time providing evidence for the existence of mutations, because it is these mutations that save Darwin’s theory. Mutations are, by definition, novel genetic material; through them, the glass ball theory is shattered. So long as mutations are unlimited, so too is the duration of natural selection. It can never be maxed out. Mutation itself prompted a great deal of confusion. Johannsen, in Dobzhansky’s time, showed that selection could not operate on genetically-identical populations. It could only work if there was genetic variation. Many pointed to this experiment as proving that mutation, and not selection, was the creative force in evolution. Again, Dobzhansky patiently points the way out by providing evidence for the randomness of mutations. Mutations are sometimes good, sometimes bad, sometimes neutral – they do not automatically adapt the organism to its environment. Selection operates on mutations to weed out the bad and promote the good. The action of natural selection can be studied experimentally only in exceptionally favorable circumstances. No major evolutionary change is noticeable in most species or organisms within a human lifetime, hence the supposition that species have become what they are now through evolution by natural selection can be at best no more than a very probable inference. It is obviously impossible to reproduce in the laboratory under controlled conditions the evolution of, for example, the horse tribe or the anthropoid apes. Nevertheless, some organisms breed much faster than horses or apes, and were amenable to scientific investigation. It is time for Dobzhansky to tell some stories. In a certain species of moth, a variant with darker pigmentation than normal arose, and over several decades, in numerous locations, increased in frequency until it supplanted the paler form. The rise of these darker moths occurred near industrial cities, and shortly after the industrialization of the country (Harrison 1920, Hasebroek 1934). It would seem that selection was favouring these darker morphs in industrialized areas, but the paler morphs in the unspoiled areas. Why? Some attributed it to the darker colouration of the plants in industrialized areas due to the production of soot. The darker morphs could hide on a soot-covered tree; the paler morphs could not, and would be more likely to be eaten. Dobzhansky does not find this explanation convincing, but nevertheless believes that some physiological difference between the morphs was promoting the selection of the darker variety. Pesticide and antibiotic resistance have been in the news a lot over the last few years, as if they were some new discovery. It is sad, then, to find out that resistance was known as early as 1914. Red scale insects in California in the early 1900s were destroying citrus crops, and so the trees were fumigated with hydrocyanic gas. Throughout California this method was successfully employed. And then, in Corona in 1914, the gas was unable to completely kill the scale bugs. Many of them were, apparently suddenly, resistant. The Corona population remained resistant from that time on, even though hydrocyanic gas continued to successfully kill red scales throughout the rest of California. Here, in one small population of red scales, a resistant variant had apparently formed via mutation and had quickly spread throughout the entire population, but this mutation had not yet appeared elsewhere. Resistance was similarly noted in two other species of scale bugs; in these cases, the resistant population quickly spread. Resistance, to this day, is one of the best examples of evolution by natural selection. Monarch (left) and viceroy (right) are Müllerian mimics. 2. Batesian mimicry à the warning colourations (or smell, behaviour etc) of a truly toxic organism are mimicked by a non-toxic organism, allowing it to escape predation without investing in energetically-costly toxins. This form of mimicry is especially interesting, because, although it provides a selective advantage to the mimic, it can actually cause harm to both the toxic organism and the predator. For example, if the mimic species does so well that it becomes quite common, predators will be more likely to associate the warning colouration with a non-toxic food source; they will be harmed when they unknowingly eat the toxic organism, and the toxic organism loses any benefit to having warning colouration since it is being eaten. The mimic, in turn, also then loses its advantage. But natural selection seems to have found ways around this. For the predator, there is constant selection pressure for better and better sensory systems to distinguish the toxic from non-toxic organisms; for the mimic there is selection for polymorphisms, that is, different forms of the same species within the same population. The population size appears smaller than it really is, when different individuals of the same species have different colourations that mimic different toxic animals. The unpalatable Valentini's sharpnose puffer is mimicked by the innocuous mimic filefish. This mimic is so good, I can't even tell which fish is which in this photo. 1. If selection was not operating in the case of mimicry, one would expect a mimic to look like the creature it is modelling in unnecessary ways. This is not, however, the case. Mimics only look like their model according to those features that predators use to hunt. Thus if a predator recognizes scent and nothing more, the mimic copies the scent and nothing more. If the predator recognizes only colour patterns, there will be no mimicry for scent or body shape, etc. 2. If mimicry was specially created, one would expect the mimic and the model to use the same chemical pathways to produce their identical colour patterns, scents, etc. But this is not the case. Selection grabs what is at hand, resulting in mimics having completely different methods of producing the same result as the model. 1. Gloger’s Rule (Allen’s Rule): races of mammals and birds in warm/humid regions have more melanin pigmentation than races in cooler/drier regions; arid deserts have more yellow and reddish-brown (phaeomelanin) pigmentation. In insects, pigmentation is higher in humid/cool regions than dry/hot regions, with humidity playing a more important role than temperature. 2. Bergmann’s Rule: Bird and mammals (and some invertebrates) living in colder climates have larger bodies than races of the same species living in warmer climates. 3. Allen’s Rule: Races of mammals in cooler regions have shorter tails, legs and ears than races of the same species from warmer regions. In birds, the same holds true for lengths of beak, legs and wings. 4. Rule for wing shape in birds: races in cooler regions have narrower and more acuminate wings than the same species in warmer regions. 5. Rule for pelage in mammals: warmer races have shorter but coarser hair and less down than cooler races. Such rules work, not only for different species, but for populations within species. When you have different populations of the same species that live in different environments, and they have adaptations for those particular environments, you have good evidence to suspect the actions of natural selection. Dobzhanky spends the rest of the chapter discussing some technical, but nonetheless important, work on phenotypic plasticity, drift-selection equilibrium and adaptive peaks. I will not bore you with any of these. But I will briefly describe some theoretical work Dobzhansky uses to show the necessity of mutations for selection, which is an important theme of his book. Mutations rescue us from this embarrassing situation. Given a probability that A will mutate to a once in every one million gametes produced, and a is moderately favoured by selection, a can go from a frequency of 0.000001 to 0.000002 in a single generation. That is clearly much faster than 320 000 generations. (Assumptions: infinite population size, random breeding). In short, the long argument of Dobzhansky’s book is that Darwin was right to give natural selection its importance as a creative agent (even if other processes like drift are also at work). Genetics, in turn, has served to shore up Darwin’s argument against seemingly damning objections. Come back next week as we briefly explore polyploidy.